Gold awards held at the Marcliffe Hotel and Spa, Aberdeen. The Gold Award Winners. Picture by COLIN RENNIE September 8, 2017. 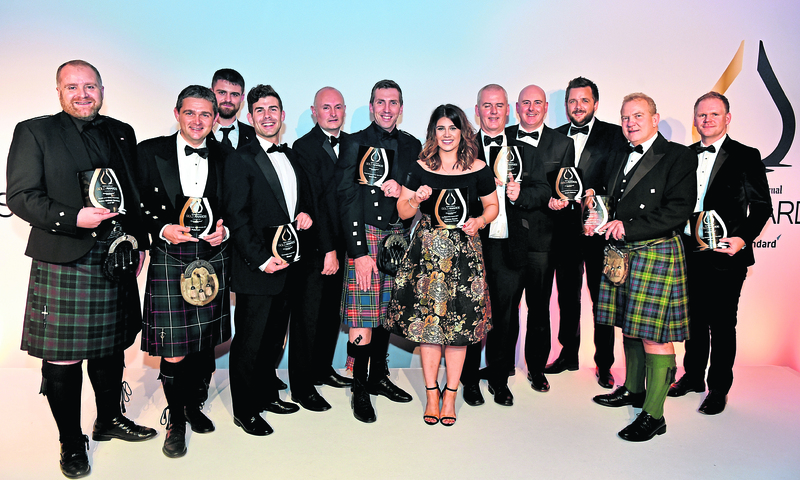 Talent from across the oil and gas industry has been whittled down to reveal the shortlist in this year’s Press and Journal Gold Awards. Respected business and energy figures gathered last week to run the rule over a strong list of nominees. Members of the judging panel had the difficult task of sorting the best from the rest ahead of the glamorous awards ceremony which will take place at the Marcliffe Hotel and Spa later this year. Judges were highly impressed by the outstanding quality of candidates discussed during the session, which was hosted by Simmons & Company International. They decided Grant MacGregor of Wood, Heather Sharkey, of EC-OG and Louise Duncan of Chevron will battle it out for the Above and Beyond Award while Fiona McKie, of Wood, Heather Sharkey, of EC-OG and Rebecca Alison, of OGTC have all been shortlisted for the Dr. Mildred Dresselhaus Award. Sector heavyweights Colette Cohen, of OGTC, Howard Johnson of Blaze and Steve Phimister of Shell are all finalists in the Industry Leader category while the Health and Safety Award, sponsored by Kelvin TOP-SET, will be taken home by either, Air Control Entech, TAQA or TWMA. Entier, Nexen and TWMA have all been named as finalists in the Large Company of the Year category while the Innovation Award, sponsored by Balmoral, will be won by either Air Control Entech, Cognitive Geology, Rig Deluge or Tendeka. Sparrows Group and Wood have both been shortlisted in the Renewables category while ICR Integrity, SengS and Siccar Point Energy will battle it out for Small Company of the Year. This year’s winner of the Hall of Fame will be announced on the night. Aberdeen Standard Investments are sponsors of the prestigious event again this year. Co chief executive, Martin Gilbert, said: “Aberdeen Standard Investments is delighted to support the P&J Gold Awards. “It’s the leading energy awards event in the north east which rightly recognises the individuals and organisations who continue to ensure the industry has a buoyant future. Brenda Wyllie, northern North Sea and west of Shetland area manager at the Oil and Gas Authority, is a judge. Jim Milne, chairman and managing director of Balmoral Group, said: “Once again, the judging session was very exciting. Choosing between all of the entries was a difficult job because there were so many good ones, but there has to be a winner. Morag McCorkindale, team leader, international trade and investment at Aberdeen City Council, and Stephen Sheal, external relationship director at the Oil and Gas Technology Centre, were also on the judging panel, chaired by Energy Voice editor Mark Lammey. Mr Lammey added: “This year’s Hall of Fame winner was up against an extremely strong field of competitors. Any of the nominees would have been worthy but, in the end, the judges were unanimous in their decision. “The person selected for this accolade admirably guided a company through the choppy waters of the last three years, providing a clear direction for the business. The awards will be held on Friday September 7. For more information email Laura Adam at laadam@dctmedia.co.uk or call 01382 575308.